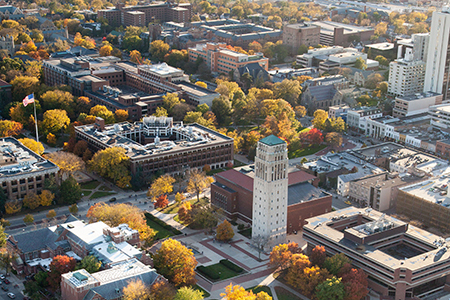 High-achieving, low-income students who receive a personalized commitment of financial aid are more than twice as likely to apply, be admitted to, and enroll in a top-tier university, according to a new University of Michigan study. Research by Susan Dynarski, U-M professor of public policy, education and economics, and several colleagues found that with an early commitment of aid, high school students were twice as likely to apply to U-M (67 percent compared to 26 percent) and twice as likely to enroll (26 percent compared to 12 percent). The researchers helped to design U-M’s High Achieving Involved Leaders (HAIL) scholarship program to reach out to low-income, high-achieving students who were uncertain about their suitability at U-M. The research also sought to address overestimates of the cost of college and procedural barriers such as financial aid forms. “Professor Dynarski’s HAIL Scholars project is a great example of what can happen when faculty apply their research skills and creativity to a challenge confronting the university— in this case, how to economically diversity the student body,” says U-M President Mark Schlissel. In a personalized mailing, students were encouraged to apply to U-M and promised four years of free tuition and fees if admitted — a value of about $60,000, with no requirement to complete financial aid forms. Parents and principals of the eligible students also were personally notified about this offer. “The HAIL scholarship gave students certainty about aid before college applications were due, when it could make a difference,” says Dynarski, who is co-director of the Education Policy Initiative at the Gerald R. Ford School of Public Policy. The vast majority of admitted students ended up filling out financial aid forms, and received far more aid than just the promised tuition and fees. These students were already eligible for generous aid; they just didn’t know it. For the scholarship, rising seniors at public schools across Michigan were identified through high school GPAs and scores on college-entrance exams (ACT or SAT) to select the sample. Forty percent of the schools were in southeast Michigan, where Ann Arbor and Detroit are located; 46 percent of schools were in the west-central region of the state, home to Grand Rapids; and 14 percent of schools were in the largely rural Upper Peninsula. Other authors of the study are C.J. Libassi of the College Board and U-M doctoral student Stephanie Owen.